I was wondering why does the program named "Newmont Sustainable Mining Bootcamp"? Why not just "Newmont Mining Bootcamp"? And then I ended up googling "sustainable mining" keyword. I found some interesting article about that topic, read some of them, related it to what I got during the program and came up with a conclusion: Newmont is promoting that their mining practice is sustainable. Is it? There are 3 fundamental components of sustainable development highlighted in the report: environmental protection, economic growth and social equity. Back to the sustainable mining thing. To be honest, i am amazed on how this mining company maintain the environment. They take a good care not only to the land they opened for operation but also to land around mining areas. From nearly 3000 hectares of land disturbed, they have done reclamation in over 800 hectares (about 27%). Fyi, PTNNT was firstly operated in 2000 and planned to be closed around 2038. As I read on a regulation paper issued by Kementrian ESDM (Permen ESDM 07 2014), the reclamation is divided into 3 phase: exploration phase, operation phase, and after-operation phase. That regulation also stated that the standard for reclamation is 80% in the after-operation phase. In the middle of their operation phase, PTNNT already done reclamation of 27% and still counting. I think it's a good stats. In the environmental experience session, i just knew that reclamation is a big deal. It involves many processes and much dollars. Money is invested not only for filling the hole with soil, but also for re-vegetation and monitor of reclamation land. If i wasn't mistaken, it cost $1.5 million per hectare for reclamation, excluding the monitoring budget. This year they targeted 35 hectare areas of reclamation. Big money. Anyway, it's not just about the money. There is a wisdom they put while doing reclamation. Trees re-planted there are the tree that once grown there. The reclamation land hopefully can be recovered as much as possible, re-creating ecosystem to be as similar as it used to be before mining. They also re-planted trees that are saved from land clearing. When they open the land, they not just cut down it all. 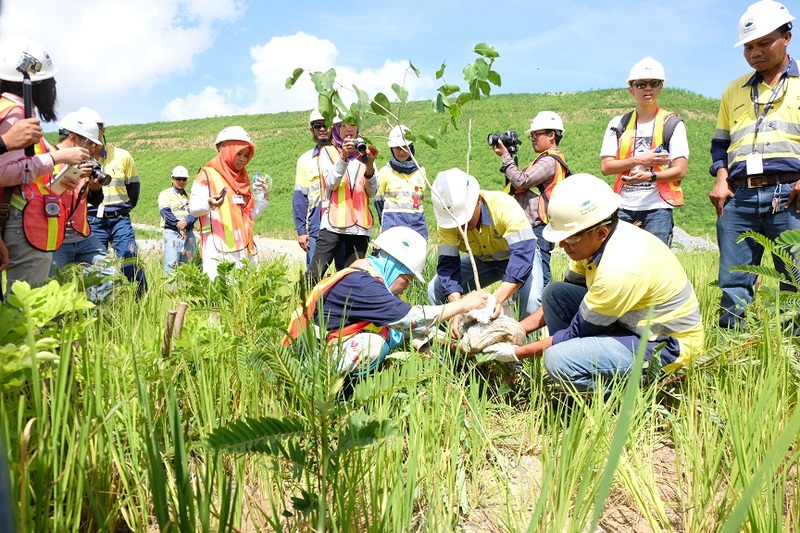 Young trees are saved to be re-planted on reclamation. Touchy, no? On that day, Bunda Intan got a chance to symbolically plant the tree. It was one that saved from land clearing they said. One more fun fact: eagles that were lived in that area before mining have returned after land successfully recovered thru reclamation. Who's happy to be home again? (as a little girl, i always happy to hear that such fact). Environmental protection in the other side is including water protection and preservation. That day, we visited Santong 3, a cavity where acid water produced from mining (called acid mining drainage) activities accommodated. 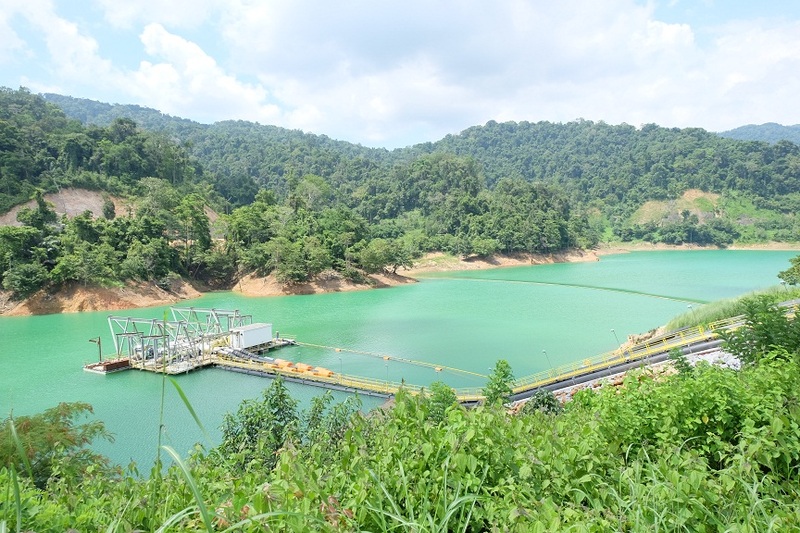 The Environmental Department maintain it regularly to make sure that it won't jumbled with fresh water form the virgin forests so water for local society around the mining site does not affected. Ground water from reclamation land also separated and monitored first in a small canal. If it matched the standard applied, the water will be released to the fresh water body. If not, the it will be released to Santong 3. They maintain the water system in such a way so that bad quality and harmful water does not flow out from the mining area. Moving to sea environment protection. As they placed tailing under deep sea water, this company also preserve life of the ecosystem down there. Environmental Department does regular monitoring to tailing placement area to see the effect of the placement to the ecosystem. So far so good as they reported. They found macro benthos on the tip of the tailing pipe. Living macro benthos. Other action they do for protecting sea environment is planting reef balls and turtle conservation. I got a chance to release a baby turtle. I named it Franklin ehehe. Oh i wish Franklin could struggle in the wild world out there. I hope he's still alive and didn't preyed by hawk or big fish to be honest. On the 5th and 6th day of the program, we were sleep over at a local's house. We can see how life goes outside the mining ring. Our group were placed in Maluk, a small town that was only an isolated village with 60s families before PTNNT operated. Mining opertion gives a very significant impact to local's economic growth. But somehow, if the economic growth is completely dependent to mine operation, it won't sustain. I think that truth was well identified by the company. Therefore they established many community development program to support and maintain local's economy. For example, in the early phase of re-vegetation, they need coconet to protect soil from erosion. Coconet is produced by PT. Ridho Bersama, a local community development located in Sekongkang, Kabupaten Sumbawa Barat. 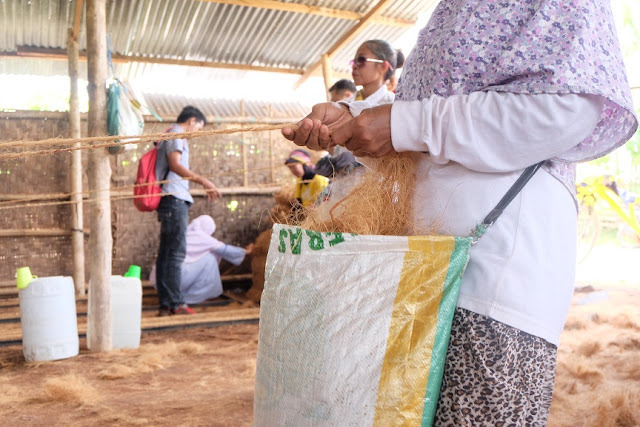 PT Ridho Bersama employed dozens of mostly housewifes around Sekongkang so they can help their family's financial. There are demands for coconet out there from Korea and China, not only demand from PTNNT. I think if this micro business managed well, they will surely sustain. 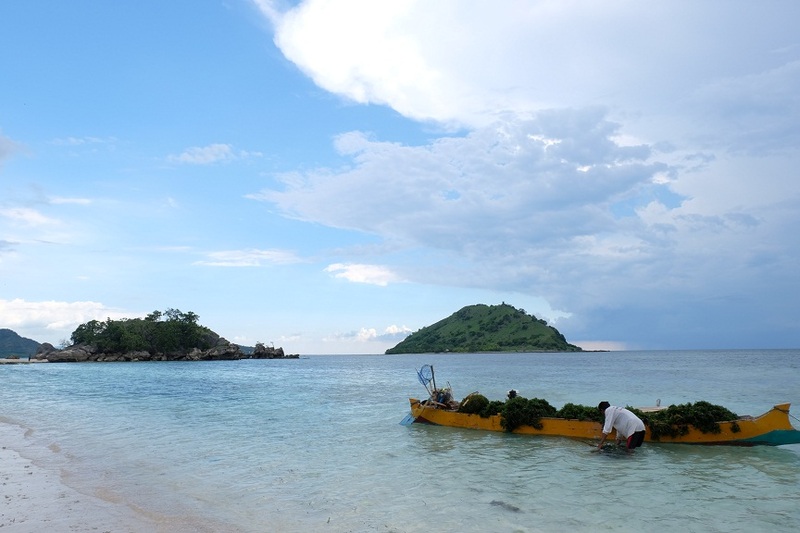 In Kertasari, the company supports a coast village to be a centre of seaweed cultivation. In Jereweh, the company supports Virgin Coconut Oil (VCO) production by locals. The company encourages locals to plant productive plants, they provide the seedlings for free! The company also support tourism development for example in Mantar for Paragliding. The company hope one day when they leave Batu Hijau, local communities can be independently take care of their economy. Another touchy wisdom. Fact that maybe most people doesn't know (i've wrote this on prev post too): from around 7.000 employees including contractors hired, only less than 1% of them is foreigner. The rest of them came from local Sumbawa and Indonesia. However, some locals who didn't know that number still complaining the company to hire them. The company in the other side have also tried to enhance local's community life standard by helping the fulfilling their basic needs: water. By building 7 bendung, it helped locals access to clean water. PTNNT CSR program are very well defined and have a certain time bound till 2038. So bad that i didn't captured it from the presentation. Back in days, I remembered that the first day we arrived here, a company officer remind that all of us there (including PTNNT) are comers and we should respect locals. Either it local community, local culture, local environment. And I think, social equity as a component of sustainable development has already applied here. And they already got the acceptance from locals. As stated in the white paper, the company license to operate is also depending on how locals accept the company. I think PTNNT already get the acceptance and moreover hearts of many locals from the way they treat people around mining site. That's true. It's impossible to carry out large-scale mining without leaving social and environmental scars. But a company which adopt the sustainable value in their practice should be able to minimize and at least medicate those hurtful scars. And somehow, after visiting the site, I put a little hope on this company: i hope they can implement more and more sustainable values in their practice. And even if they leave scars, i hope it will be a beautiful scar. A beautiful one to remember. I have no capacity to judge if the mining practice in Batu Hijau is Sustainable or not since I do not have any certain key parameters and indicators. I just compare what I see during the program to what i read about how it should be in a very qualitative way. "Reinventing Mining: Creating Sustainable Value". KIN Catalyst. "Presentasi Pengelolaan Lingkungan PTNNT". 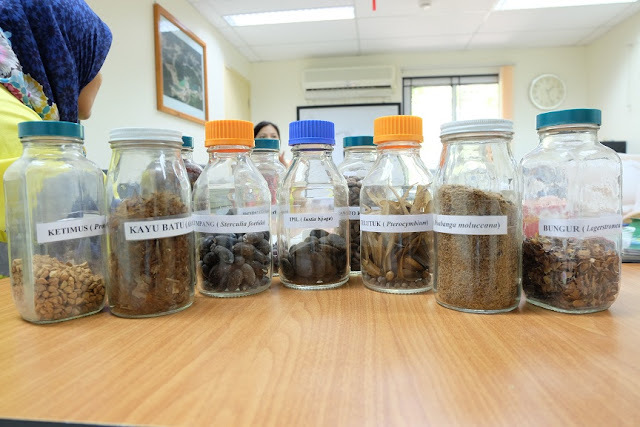 PTNNT Environmental Department Presentation. I really proud to be part of "Sustainable Mining Bootcamp",cause i can learn the knowledge that i never know before and i look with my eyes that newmont do the responsibilities for the peoples around the Batu Hijau. Wow...this even better than the article before in Bahasa. Sounds more serious. Good article. Good job Kadek. Whoaa, the article full with statistic data. Well written, Kadek! A very nice summary of what did during the bootcamp, Kadek!